Transnational mobility in the European Union has become a key factor for supra-national integration, equal life chances, and socio-economic prosperity. This book explores the cultural and social patterns that shape people’s migration, the historical and contemporary patterns of their movement and the manifold consequences of their migration for themselves and their families. Exploring the links between social and spatial mobility, the book draws attention to the complexity of moving and staying, as ways in which social inequalities are shaped and reinforced. 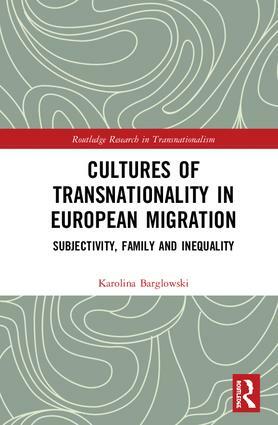 Grounded in research conducted in Germany and Poland, the book develops the concept of "cultures of transnationality" to analytically frame the variety of expectations involved in migration, and how they shape migration dispositions, opportunities, and outcomes. Cultures of Transnationality in European Migration will be of broad interest to scholars and students of transnational migration, European development, cultural sociology, intersectionality, and subjectivity. Specifically, it will appeal to scholars interested in the cultural ramifications of moving and staying as well as those interested in the interplay of gender, ethnicity, and class, in the making of social inequality. Karolina Barglowski is a Junior Professor of the Sociology of Migration at Technical University Dortmund, Germany. Her research focuses on social inequality, European migration, transnational social protection, qualitative methods, and cultural sociology.